The sprightly ‘little glass-wing’ has become much more common here since the 19th century. Scudder called it “exceedingly rare” in New England, and “confined to the southern portions" (1889: 1745). Like the Delaware Skipper in 1900, and the Zabulon Skipper today, Little Glassywing seems to have first arrived in the state by moving up the Connecticut River valley. Scudder does not mention Little Glassywing in his 1862 list of butterflies of New England, having evidently not seen any local specimens by then. By 1889 he can cite specimens from only four Massachusetts locations, all in the Connecticut River valley: Mt. Tom, South Hadley, Amherst Notch, and Springfield. Thaddeus Harris did not have this species in his 1820-1850 Boston area collection (Index). Collector F. H. Sprague did not have it on his lengthy 1878 list for the Boston area (Sprague 1879); he found it only in Amherst (1885, 1886; twelve specimens in the MCZ). W. T. M. Forbes (1909) did not report it from around Worcester. Although many other skippers were known in eastern Massachusetts at the turn of the century, Little Glassywing had not been found. Little Glassywing was first described and named by W. H. Edwards from an Illinois specimen; surprisingly it was not named for a Native American. Its range is very similar to that of Northern Broken-Dash, though a little more restricted at the southern and northern extremes (Opler and Krizek 1984; Cech 2005). Recent records from the Maine Butterfly Survey show Little Glassywing found in only a few towns along the southern coast, where it may have arrived but recently, since there are no historical records (MBS 2010). By contrast Northern Broken-Dash is found in slightly more towns in southern Maine, and there is one recent record for Northern Broken-Dash in central Maine. Little Glassywing reaches Canada only in southern Ontario and along the border of Quebec, whereas Northern Broken-Dash is found much further into Canada (Layberry 1998). Little Glassywing appears to have been expanding northward in the 20th century, like the Delaware Skipper. In New Jersey, a 1990’s review of historical sources indicates that this species was increasing there between 1890 and 1910, and by the 1990's was “more common today than a century ago" (Gochfeld and Burger 1997: 243). Little Glassywing appears to have arrived in eastern Massachusetts in the 1920's (Stichter 2013b). Reviewing New England lepidoptera in the 1930’s, Farquhar (1934) found Little Glassywing “exceedingly rare,” but was able to cite one specimen from eastern Massachusetts: from Stoneham, caught by noted collector C. V. Blackburn. This specimen appears to be the earliest dated record of Little Glassywing in eastern Massachusetts; it is a male dated June 30, 1929, and is now in the Insect Collection at Furman University in South Carolina (http://eweb.furman.edu/~snyderjohn/collection/insecta_collector.php). However, in the Harvard MCZ there are also two Weston specimens, by C. J. Paine, undated but likely from the 1920's. There is also an August 1930 specimen in a Denton mount from Stoughton, in the Hagelstein collection. Other than Stoneham, Farquhar knew only those western Massachusetts locations cited by Scudder. On Nantucket and Martha's Vineyard, Jones and Kimball (1943) did not find Little Glassywing, saying its putative presence was "not verifiable," and there are no mid-century specimens from these well-collected islands. The next earliest eastern Massachusetts specimens appear to be six collected in North Weymouth in 1936 by C. L. and P. S. Remington, and one each from Canton and Fall River that year (Yale Peabody Museum). By the 1940's, W. P. Rogers had collected quite a few from around coastal Bristol County--Fall River, Freetown and New Bedford (Yale Peabody Museum), and in 1942 V. Nabokov collected it in Wellesley (MCZ). Like several other species, Little Glassywing may have arrived in eastern Massachusetts by diffusing northeastward along the coast from Connecticut, rather than by moving eastward from the Connecticut River valley (Stichter 2013b). By the 1960’s and 1970s, Little Glassywing was becoming more common in Massachusetts (Table 2). As an interesting new species, it was widely collected. Mark Mello found it in Rochester in July 1961 (Mello, pers. collection). C. G. Oliver found it in West Acton, Acton Center and Belmont 1956-1965 (Yale Peabody Museum). William D. Winter found it in 1966 in Dover, 1972 in Westwood, and 1974 in Millis and Sherborn and West Medway (specimens in the Harvard MCZ). Edward Peters took males and females in Carlisle in August 1970 and July 1971, and Darryl Willis reported Little Glassywing as “common” in July 1974 in the Holliston-Sherborn area (Lep. Soc. Seas. Sum. and Corresp. 1959-81). The species was also apparently moving into higher-elevation Berkshire County: L. F. Gall documented Little Glassywing on 9 July 1974, finding a specimen in Becket, and earlier--1947-- it had been found in New Marlborough on the Connecticut border (Yale Peabody Museum). The most widely reported host grass for Little Glassywing is Tridens flavus, known as purpletop or tall redtop (Scott 1986; Opler and Krizek 1984; Cech 2005). Many sources report purpletop as the sole host grass, but as Leahy points out in the MAS Atlas, this is a somewhat uncommon and locally distributed plant in Massachusetts, and given that Little Glassywing is now quite common and widespread here, it probably uses other grasses as well. Tridens flavus was introduced to nearly all Massachusetts counties from further south (Sorrie and Somers 1999), and perhaps Little Glassywing increased here as this grass has become more widespread. It is still not a common grass in either Berkshire or Bristol Counties (Magee and Ahles 1999). The Connecticut Atlas did not find eggs or larvae in the wild, but raised Little Glassywing in the lab on Tridens flavus, Schizachryrium scoparius (little bluestem), and Dactylis glomerata (orchard grass). Field evidence is needed to determine what the natural host grass is today in our area, but all of these grasses are likely candidates. Little Glassywing’s preferred habitat is widely reported to be both moist meadows and woodland roads and edges (O’Donnell et al. 2007; Cech 2005; Opler and Krizek 1984; Layberry 1998; Shapiro 1974). In moist meadows, it is often found flying along with Northern Broken-Dash and Dun Skipper and nectaring on common and swamp milkweeds, vetch, dogbane, self-heal, and perennial pea. However, the purported sole larval host plant, purpletop, is a facultative upland grass, occurring most often in dry sandy woods and woods edges (Magee and Ahles 1999; Leahy, Atlas), and Little Glassywing may particularly use areas near woodlands for larval feeding. It seems safe to say that Little Glassywing probably utilizes all types of grassy open areas, wet, mesic and dry, for nectar and larval hosts, but may particularly need inland dry areas for larval hosts. NatureServe (2010) says that it is “not usually seen far from trees,” but its habitat “may vary regionally.” Cech (2005) classes Little Glassywing as an adaptable meadow-habitat generalist. Whereas the Atlas had termed Little Glassywing “Common,” MBC Sightings 2000-2007 rank it as “Uncommon-to-Common,” about on a par with Long Dash, Tawny-edged, and Hobomok Skippers, and less common than Northern Broken-Dash (Table 5). It is not reported in anywhere near the same numbers as Peck’s Skipper, which is ranked Common, and is less common than the next most numerous skippers, Least and Dun Skippers. However, as noted, Little Glassywing has almost certainly increased in abundance since Scudder’s time. There is a broad upward trend in MBC sightings per trip reports shown in Chart 97. Little Glassywing is one of several grass skippers to show an increase in sightings over this period; the others are Least Skipper, Tawny-edged Skipper, Northern Broken-Dash, and Dusted Skipper. A separate list-length analysis of MBC data also found a statistically significant 36.1% increase in detectibility of Little Glassywing between 1992 and 2010 (Breed et. al. 2012). So both methods of analysis are pointing in the same direction. In Chart 97 the reading for 1997 may be artificially high and should probably be lowered. It results mainly from an unusual report of 85 from the Outer Cape NABA count, which was not approached in subsequent years and probably should be adjusted downward. Map 97 shows 1992-2013 records of Little Glassywing from 134 of a possible 351 towns in Massachusetts. The records include many towns in western Massachusetts, such as New Marlborough, Sheffield, Pittsfield, Cheshire, Windsor, Williamstown and others in Berkshire County, and Ashfield, Cummington and Williamsburg in the foothills. This skipper is now well distributed across the state except, surprisingly, Martha's Vineyard and Nantucket. Most white or gap areas on the mainland part of the map are likely due simply to a lack of reporters from those towns. Little Glassywing is regularly found on all of the July NABA Counts, including the three Berkshire County Counts but excepting Martha’s Vineyard. It is interesting that Little Glassywing still appears to be absent from Nantucket and Martha‘s Vineyard. BOM-MBC has no records for either island. For Nantucket, the Atlas reported one sight record (7/10/1991 J. Anderson), but there are no historical records and recent observers have not found it (LoPresti 2011). The Martha’s Vineyard checklist does not list Little Glassywing at all--- in contrast to Northern Broken-Dash, which is listed as “Common” on the Vineyard (Pelikan 2002). Mark Mello did not find Little Glassywing on his 2001-2 survey of the Boston Harbor Islands, nor on the Elizabeth Islands (Mello 2003; 1988). Perhaps the dry woodland-edge habitat (see above) is in short supply on coastal islands. The 1986-90 Atlas had found Little Glassywing less common on Cape Cod than elsewhere, and recent records suggest the same. In the late 1990’s, some unusually large numbers were reported from the Outer Cape (Truro) area on the NABA Counts, but they seem likely to have been a one-time outbreak. There have been no reports of Little Glassywing from the Truro/Provincetown area since 1999, through 2013. Since 1999, the species has only twice been reported on the Falmouth count, in 2010 and 2011, and sparingly from the other Cape Cod Counts. Mello and Hansen (2004: 64) say Little Glassywing can be regularly seen at Fort Hill, Higgins Windmill, and Webster Farm Conservation Area on the Cape. Except for Cape Cod and lower Bristol County, Little Glassywing is reported every year in good numbers from most other NABA Counts around the state, including in recent years, the three Berkshire Counts (highest raw numbers 23 on 7/13/2013, Northern Berkshire and 96 on 7/20/2013 Central Berkshire). Amherst Amity Place, 8 on 7/1/2007F. Model; Boston, 5 on 7/15/1996 B. Malcolm; Boylston Tower Hill, 18 on 7/3/2013, W. Miller; Canton Great Blue Hill, 13 on 7/8/2006 M. Champagne and E. Nielsen; Charlton power line, 14 on 7/26/1997 R. Hildreth; Cheshire, 12 on 7/9/2011 B. Benner; East Longmeadow Parker yard, 7 on 7/7/2007 K Parker; Grafton Dauphinais Park, 6 on 7/6/2007 D. Price; Harvard Oxbow NWR, 5 on 7/18/2004 T. Murray; Leicester, 6 on 7/30/2003 M. Rowden and E. Barry; Lexington Great Meadows, 4 on 7/5/1997 M. Pelikan; Milford, 5 on 7/16/1999 R. Hildreth; New Ashford Mt. Greylock Headquarters, 3 on 7/13/2013, T. Armata; New Marlborough, 16 on 7/12/2013 B. Benner; Newbury Martin Burns WMA, 8 on 7/8/2007 B. Walker et al., and Old Town Hill, 24 on 7/2/2011 E. Nielsen; Newburyport Maudslay SP, 16 on 7/10/2007 S. and J. Stichter, and Water Tower, 25 on 6/26/2010 B. Zaremba; Northampton community gardens, 8 on 7/24/2007 F. Model; Paxton Moore SP, 11 on 7/5/2013, E. Barry; Sharon Moose Hill Farm, 33 on 7/12/2009 E. Nielsen; Sheffield Bartholomew's Cobble, 4 on 7/27/2013, S. Moore et al. ; Sutton Lasell Rd., 24 on 7/6/2013, W. Miller et al. ; Truro Horton's, 8 on 7/17/1999 A. Robb and B. Nikula; Upton Robertson's gas line, 11 on 7/4/1999 T. and C. Dodd; Wales Norcross WS, 33 on 6/28/2012, E. Barry et al. ; West Newbury Mill Pond Rec area, 14 on 7/3/2005 S. Stichter et al. ; Williamsburg Graves Farm, 15 on 7/1/2011 B. Benner et al. ; Williamstown, 11 on 7/15/2009 B. Zaremba, and Mountain Meadow Preserve, 4 on 7/5/2008 P. Weatherbee; Woburn Horn Pond Mountain, 5 on 7/5/2009 M. Rines et al. ; Worcester Broad Meadow Brook WS, 6 on 7/14/2003 B. Walker. The midseason univoltine skippers, such as Little Glassywing and Northern Broken-Dash, are more common and seem to have an easier time of it than the early and late season species with only one brood, like Cobweb and Leonard’s. Like Northern Broken-Dash, Little Glassywing apparently has only one long midsummer brood in our area. Its flight starts and peaks a little earlier than does that of Northern Broken-Dash. . According to the MBC 1993-2008 flight chart, Little Glassywing flies from the beginning of June through August, numbers peaking in the first three weeks of July, tapering off after that (http://www.naba.org/chapters/nabambc/flight-dates-chart.asp). Only one brood is visible in the data. Reports may be compromised by some identification confusion with the more common Northern Broken-Dash. Earliest sightings: In the 23 years of BOM-MBC records 1991-2013, the seven earliest "first sightings" are 5/24/2004 East Longmeadow, K. Parker; 5/28/1998 Northampton Florence T. Gagnon; 6/4/1999 Paxton, E. Barry; 6/10/2000 Westwood Hale Reservation E. Nielsen; 6/10/2007 Sherborn power line B. Bowker; 6/12/1996 Hampden G. Howe; and 6/15/1991 Princeton Wachusett Meadow, T. Dodd. More recent years do not show any additional advancement in flight time; between 2009 and 2013 the earliest "first sighting" was 6/17/2010 Ware, B. Klassanos. The summer emergers are not as affected by warm spring temperatures as are the spring emergers. Latest sightings: In the same 23 years of records, the seven latest "last sighting" dates are 9/7/2008 Northampton community gardens, T. Gagnon; 8/29/1992 Worcester, T. Dodd; 8/28/2005 Canton Great Blue Hill, E. Nielsen; 8/25/2009 Sherborn power line, B. Zaremba; 8/24/1998 Mansfield, R. Hildreth; 8/23/2011 Sandwich, J. Dwelly; and 8/23/1997 Cape Ann, D. Savich. We do not usually see this species flying into September (only one report), but there are many late August reports. Scudder had suggested the flight ended at the end of July, but today's records still show good numbers seen through the first three weeks of August. There appears to have been some lengthening of the flight time over the last century. In warmer climates, Little Glassywing does produce two broods, and evidence of second broods in our area should be watched for. On 8/21/2013 two photographs of fresh individuals, taken in Riverside Conn. by C. Ehlinger, were posted on the BAMONA website. It is not out of the question that late August individuals in Massachusetts represent a partial second brood. In the 1990's, Glassberg (1993) reported an occasional partial second brood in August in the Philadelphia area, but that had not been observed in New Jersey (Gochfeld and Burger 1997). In the 1960's Shapiro (1966) reported second broods only as far north as Virginia. Climate change may make a second brood possible further north. Little Glassywing ranges throughout southeastern United States, and should be able to adapt to climate warming in the northeast and perhaps increase in numbers here (Table 6). 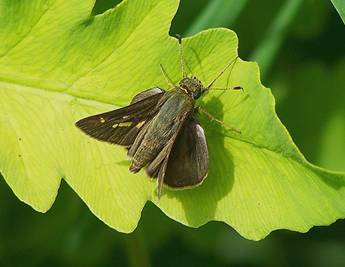 Conservation and proper management of open dry and wet meadows is necessary to provide habitat for this and many other skippers. Grassy areas that are mowed more than twice a year, such as most lawns, golf courses, roadsides and city parks, do not provide habitat, beyond occasional nectar from white clover (NatureServe 2010; MBC Mowing Guidelines http://www.naba.org/chapters/nabambc/butterfly-conservation.asp ) . Little Glassywing caterpillars will be feeding on grasses in late summer and early fall, and then over-wintering at the soil surface. A single mowing in late fall, with the cutting blade set on high, should allow some larvae to survive in a field, over-winter, and resume growth in the spring. Mowing during flight time (reducing nectar sources) and during active larval feeding in spring, summer and early fall is counter-productive.